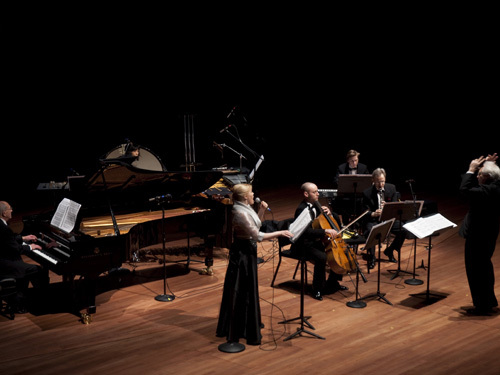 During the week of March 15-18, the Chamber Music Society immersed itself in the music of Finland, performing thirteen works by ten composers, including a world premiere. 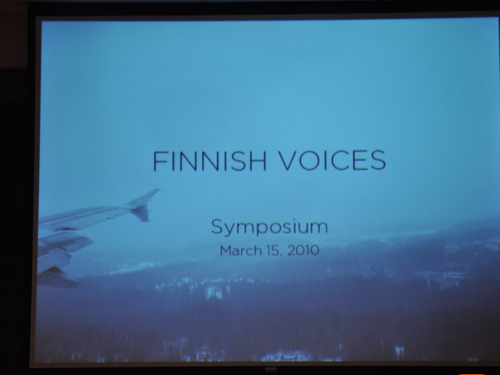 All this was accomplished with the help of eight visiting Finnish musicians, in collaboration with eight artists from America. 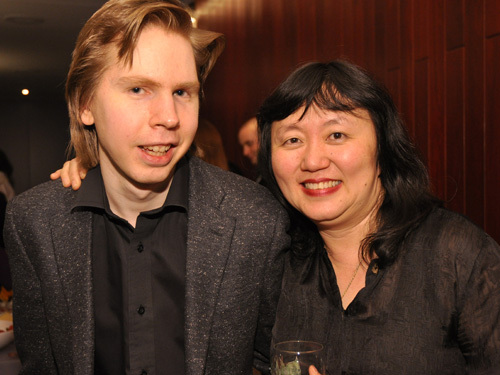 The project, begun with Wu Han’s visit to Finland two years ago, was a cultural collaboration between the Chamber Music Society and the Finnish Consulate. In late February and early March, 2008, at the invitation of Finnish cultural attaché Illka Kalliomaa, Wu Han traveled to Helsinki with CMS Director of Artistic Programs Michael Lawrence to meet Finnish musicians, hear Finnish music, and formulate a musical partnership between CMS and the music and musicians of Finland. The country’s vibrant musical scene had long fascinated us, as Finnish instrumentalists, conductors and composers have enjoyed an increasingly strong presence on the world’s stages. 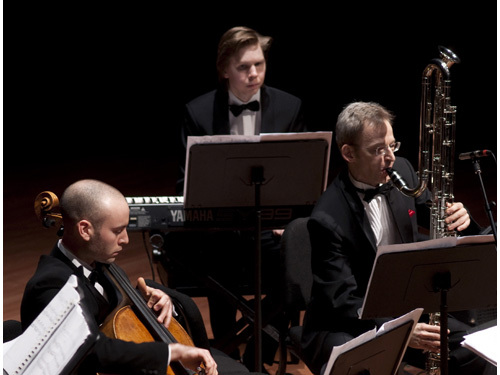 The first component of the project – CMS’s concert tour of Finland – fell victim to the financial crisis and had to be postponed (we hope very much to re-mount this in the future, when CMS musicians will travel to Finland to collaborate in concerts of Finnish, European and American works with our Finnish friends). However, the New York portion of the partnership went off without a hitch, and in retrospect has emerged as one of the highlights of our entire tenure so far at CMS. 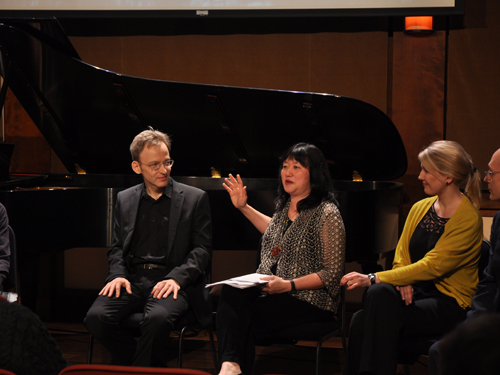 The week began on Monday evening in the Rose Studio, with a special symposium hosted by Wu Han and Michael Lawrence. 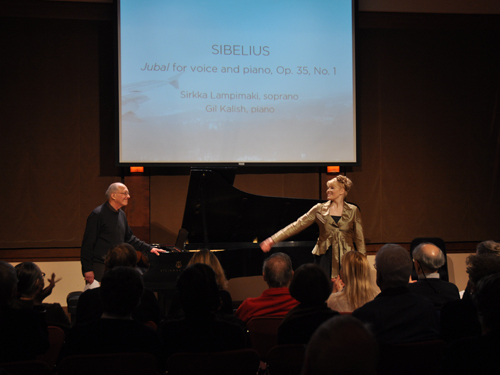 After an inaugural performance of a song of Sibelius by pianist Gilbert Kalish and soprano Sirkka Lampimäki, Finnish artists answered questions from Wu Han about their country’s amazing musical culture. Joining Wu Han and Michael (who gave the audience a clear and concise overview of Finnish history at the outset) were pianist Juho Pohjonen (already a CMS 2 artist), soprano Sirkka Lampimäki, clarinetist Kari Kriikku, and violinists Petri Aarnio and Elina Vähälä. Their fascinating discussion ranged from explanations of Finnish folklore (the Kalevala legend and its connections to music) to descriptions of the contemporary music scene (composing styles all over the map) and the subtleties of the Finn’s approach to musical interpretation (intuitive, read-between-the-lines as opposed to analytical/literal). Following the symposium, Wu Han and I treated the musicians to an enthusiastically and voraciously consumed dinner at our favorite neighborhood restaurant, Planet Sushi. On the following evening, the Tully Hall concert presented works of Sibelius, Kuula, Tiensuu, Salonen, Lindberg and Mustonen. Four beautiful songs, sung by Sirkka in crystalline, rapturous style and accompanied by Gil Kalish, set the mood for the large crowd that turned up to hear a truly adventurous program. The world premiere by Jukka Tiensuu (born 1948) and commissioned by CMS, followed. Scored for piano, clarinet, violin, viola and cello, the piece seemed to be an instant hit with the audience and performers, and we are already talking about taking it on CMS tours. The New Helsinki Quartet closed the first half with a deft performance of the magical string quartet of Sibelius, composed in 1909. The intermission was followed by the evening’s most outrageous work, titled Floof, by conductor/composer Esa-Pekka Salonen. Scored for soprano, clarinet/contrabass clarinet, cello, piano, synthesizer and percussion, the piece is about a robot that is being programmed to speak poetry. 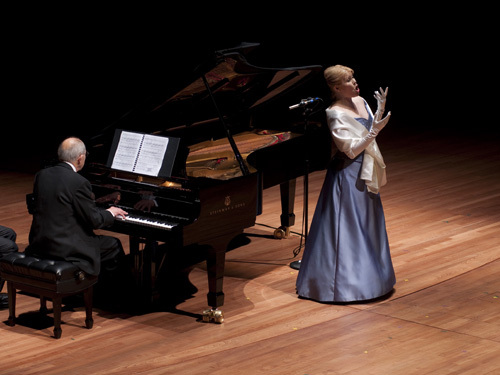 Soprano Sirkka Lampimäki, who not an hour before had opened the concerts with heavenly sounds, was now back on stage using a hand-held microphone, sputtering, coughing, talking, screaming and occasionally singing as she portrayed the robot mastering the process of inventing its own poetry. Having been composed for Finland’s Toimmii Ensemble (“Toimmii” means “It works” in Finnish), the work supported the group’s mission well: to create and perform music of a kind which is “the wilder the better.” You had to have been there. The whole thing was expertly conducted by Fred Sherry, master of complex music. Following a masterfully-swift removal of all the electronics and percussion by the expert Tully stage crew, violinist Cho-Liang Lin joined Elina Vähälä, Richard O’Neill, Fred Sherry and Juho Pohjonen for Magnus Lindberg’s “…de Tartuffe, je crois” (“from Tartuffe, I Presume”), a work which Jimmy (Cho-Liang Lin) had already programmed and performed in his capacity as Artistic Director of La Jolla SummerFest. Composed in 1981, it has already become something of a Finnish contemporary music classic, and is also a good candidate for CMS touring programs. The program closed with a rousing performance of the Nonet No. 2 by pianist Olli Mustonen. Composed for two string quartets plus bass in an overtly classical style, the work has reminisces of Schubert, Schumann, Vivaldi, and Bach, colored by contemporary harmonies. 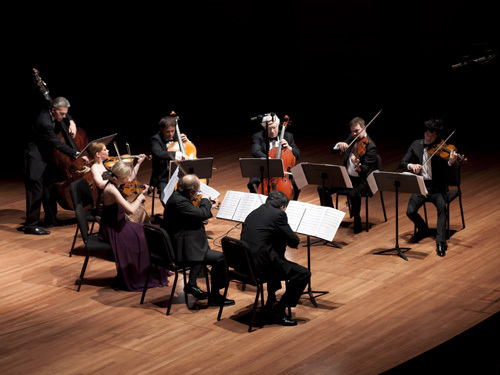 It is expertly composed and virtuosic in style, and brought the two-and-a-half hour concert to an excited conclusion. 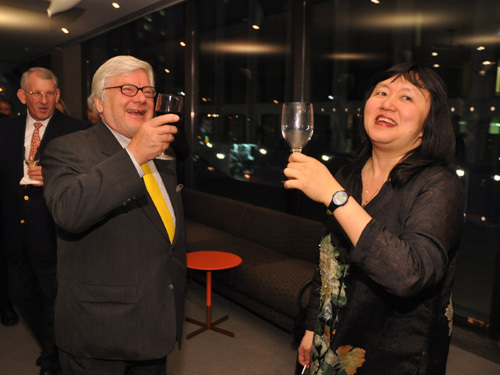 CMS patrons and musicians mingled afterwards in the hall’s new Hauser Pavilion, and Wu Han expressed our gratitude for the contributions of all the musicians, as well as for the significant support of the Finnish Consulate, and cultural attaché Ilkka Kalliomaa. The following evening, following another day of intensive rehearsals, an elegant reception was hosted for us by the Finnish Consul General Ritva Jolkkonen, at the stunning residence of the ambassador on Fifth Avenue. Thursday night brought the week’s project to a conclusion with the Finnish concert on the CMS New Music in the Rose series. The evening’s performances – in front of an over-sold house – included works by Kaija Saariaho, Einojuhani Rautavaara, Uljas Pulkkis and Jouini Kaipainen, in addition to more pieces by Magnus Lindberg and Jukka Tiensuu. Composer Bruce Adolphe hosted and provided insights on the composers and the music in his inimitably informative and entertaining style, and after a truly masterful performance by the New Helsinki Quartet of Kaipainen’s 5th quartet, the week of Finnish immersion came to an end. 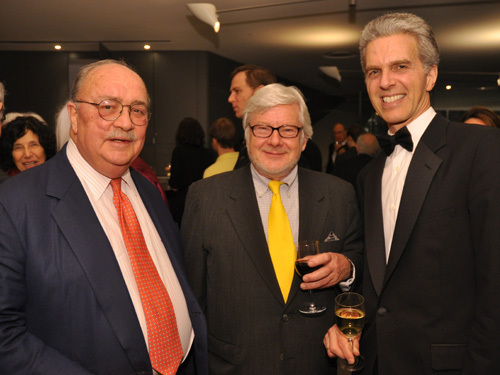 However, the friendship and ties that were formed between us all – the Finnish musicians and dignitaries, CMS musicians, patrons and board members, and the two of us – are really only the beginning of a relationship that has a bright and exciting future. 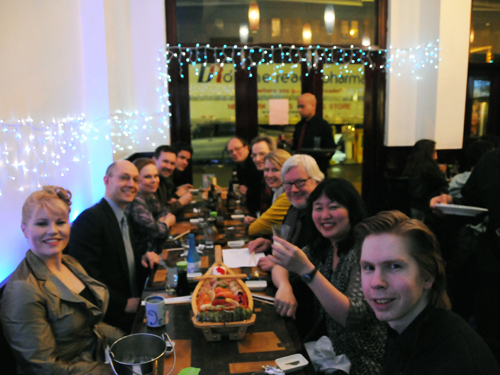 We look forward to collaborating again with these charismatic and creative performers, both here and in Finland. We are more curious than ever about new music emerging from Finland, as well as fascinating older music that we have yet to hear. 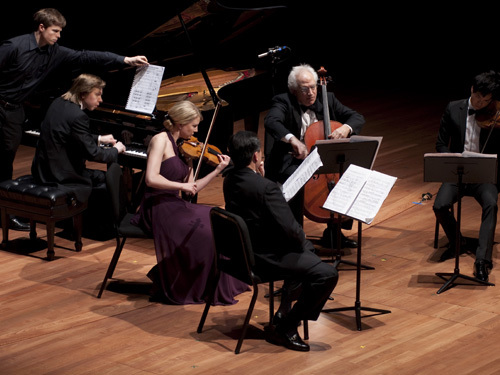 This project serves as an example for CMS of what can be accomplished if we reach out beyond our borders, breaking them down in the process, and truly become, as CMS should be, an international center for chamber music. Competing against the sound of jet planes means playing closer to the bridge! Adding high overtones to the sound makes it more brilliant and enables it to cut through. Here’s proof, and how to do it. It’s very common that we are required to make an even sound while using unequal bow speeds. Here’s how to compensate and not allow inconsistent bow speeds interfere with the musical line. The beginning of consistent sound production is even bow speed. Here’s how to measure it accurately and develop your ability to pull the bow at the same speed from frog to tip and back. Cello Talk 70: Sound Production I: What Makes it Loud? An explanation of how volume is produced on the cello.